Final preparations are being made for the 20th anniversary of the 1995 Million Man March, which drew an estimated two million men from all across the country. 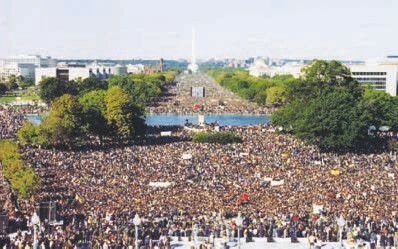 October 10, 2015, is expected to include a diverse crowd for the “Justice or Else!” march that will take place on the National Mall beginning with community prayer at 7 a.m.
Twenty years ago, the Honorable Minister Louis Farrakhan called for one million men to converge on the nation’s capital – nearly two million answered the call focusing on the theme of atonement, reconciliation and responsibility. And in just a few days, on Saturday, Oct. 10, Black men, women and children from across the country will return to the District to commemorate the 20th anniversary of the landmark event – the Million Man March – and to promote swift but lasting change. “This promises to be an historical and pivotal moment in our country’s history and in our struggle for freedom, justice and equality,” said Muhammad who also serves as the national assistant to Farrakhan.